"Arafel": "The nations not so blest as thee Must, in their turn, to tyrants fall, While thou shalt flourish great and free: The dread and envy of them all." "The nations not so blest as thee Must, in their turn, to tyrants fall, While thou shalt flourish great and free: The dread and envy of them all." 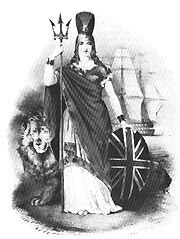 "Originally, Great Britain was called ‘Albion’ by the Romans, who invaded Britain in 55BC, but this later became ‘Britannia’. This Latin word referred to England and Wales, but was no longer used for a long time after the Romans left. *So at least "one" won't need to build a wall all the way around!